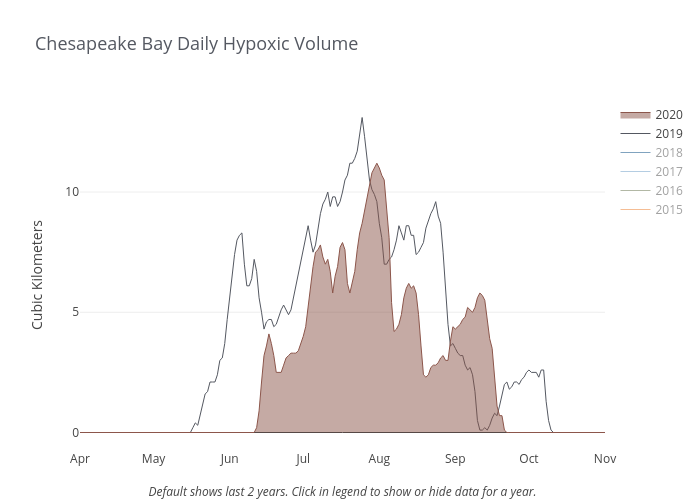 Dlmalm's interactive graph and data of "Chesapeake Bay Daily Hypoxic Volume" is a line chart, showing 2014, 2015, 2016, 2017, 2018; with Click within the legend to show or hide data for a year or years. in the x-axis and Cubic Kilometers in the y-axis.. The x-axis shows values from 2014-04-01 to 2014-11-01. The y-axis shows values from -0.6 to 11.4.